For this minicast, we discuss a madam far removed from Madame de Pompadour; another country, another time period, a different social class. However, both used similar tools to gain power and influence; both used brains in addition to body to make their marks, and both had ties to a title that they were not born to. The madam du jour is Annie Chambers, the Queen of the Kansas City Red Light District! Because we live in Kansas City, this woman’s life was physically close to us- but she was brought to our attention by one of our listeners! A sweet man named Donald sent us an email suggesting that we research this woman whose history he had become fascinated with many years ago while on a visit to our fair city. Just a quick search and we were hooked. We can’t tell you enough, your suggestions really do influence who we discuss- usually if you are interested in learning more, so are we! Born in Kentucky in 1842, she was given the name Leannah Loveall (That’s enough to grab your attention right? A woman of negotiable affections has LOVEALL as her surname?) The family moved to Sullivan, Indiana when Annie was just a young girl so that Dad could operate a hotel. If Annie’s story were a novel, it would begin on a day that was different, a day when change began. That day was when Abraham Lincoln was campaigning for the 1860 election and he came through Sullivan. Annie, against her father’s desires, rode on horseback in the parade. She made a decision and marched in that parade for Abraham Lincoln, and it changed her life. We talk about what happened in the podcast- her life as a teacher, and as a woman who married very much like many women did at the time. We talk about her son, his death, and another three days of tragedy that sent her life off on an entirely different path that takes her from sporting houses in Indiana to her own “resort” in Kansas City. 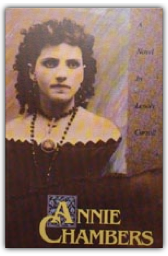 Annie’s is a story about pulling yourself up by your bootstraps. Yes, it is also a story about prostitution and brothels, about the Kansas City Red Light district and “sporting life”. A tale of a Madam With a Heart of Gold who tried to treat her girls right. But she was a smart business woman who was always looking for ways to expand, always looking for the best for both her clients and her girls. She guided the woman who came to her to vastly improved lives, boasting a high success rate for sending her “girls” off to respectable lives and marriage. Even in death, she used her wealth wisely. Her estate was bequeathed to the City Union Mission, an organization that is still providing support to the people of Kansas City. Of course, we go into all those details in the podcast, name drop again (Carrie Nation! ) And chat about details of her life including a VERY May/December romance and marriage later in her life! 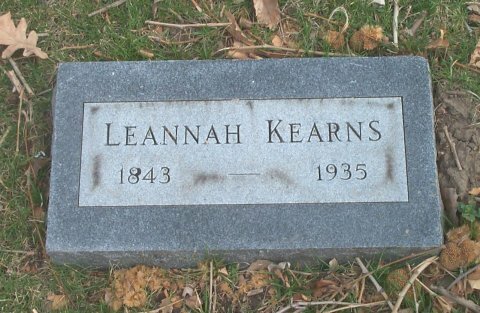 Annie Chambers died on March 24, 1935 and is buried in Kansas City, her grave marked with the last legal married name that she had, Leannah Kearns. The story of Annie Chambers is a remarkable adventure during a very exciting time in the history of the United States and we are thrilled to be able to share it with you. A good place to continue your journey learning more about the life of Annie Chambers is this short video produced by the Kansas City Public Library and available through KCPT . It’s not boring and dry, really! Check it out! And here is recommended reading about this woman and her times from the Kansas City Public Library. Another really informative stop is this family ancestry blog. After reading about Annie, we will confess that we clicked around the site and read more about the other people and times that are contained in this website – although they are not directly related to the topic at hand. We just get nosey like that sometimes. You never know what you are going to find! We know that sometimes we introduce you to women you may not have known. This time it was one of our listeners who introduced us, and we are so very grateful that he did! Loved this segment. As a Kansas Citian that loves history, I really appreciated the content. 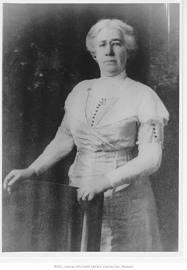 Aside from Sarah Coates, there was a considerable amount of women activists at the turn of the 20th century. The Kansas City Women’s clubs had a great amount of influence on the social, economic and educational development of the city along with actual physical growth including famous architectural buildings and designs of entire city blocks. Groups like the Athenaeum Club, a women’s club (largely well to do matrons), held educational seminars that were so impressive they were recognized by the college accreditation board of that time as an academy for women. ONe of the founders of the club, Carolyn Fuller, came to Kansas City to start become and actress and concert vocalist. She married a very wealthy banker and went on to become the first female member of the board of education for Kansas City and founded the first PTA. The Athaneaum club and it’s spin off The YOung Matrons were politically active, too. One of their first small achievements was to force the city to appoint a milk inspector. At the time, refrigeration of milk being delivered from the dairies was non existent. Botulism was rampant and was the number one culprit in infant mortality as many women had switched to bottle feeding because they were beginning to seek employment in the fields opening up to them (beyond Annie’s resort). These same organizations within a few decades were powerful and influential enough to organize a “clean sweep” of city hall and the police commission that was over run with corruption from the Pendergast political machine. The women built their own club house that is still standing on Linwood today. The club exists, but largely doing charitable work. These are just a few of the great stories about how women shaped the “Paris on the Prairie” even as most history books give the most credit to the men. Without the women, Kansas City would not be the civilized and sprawling metropolis of today. 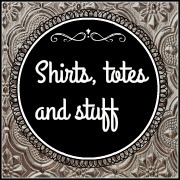 Another great place on the web to read about Kansas City is vintagekansascity.com. Loved the site. Got it booked mark. Can’t wait to see what you all come up with next. Thanks so much for all of the information – do you know the history of that “Young Matrons” building on 51st ish and Main? We also are following the history of Fred Harvey, whose family lived in what is now Hyde Park. Kansas City has a truly fascinating history!